In the first part of this series, we have learned the basics of playing DaMath. We have learned the initial position of pieces on the board, how to move the pieces, how to capture the opponent’s piece, and how to score exchanges. In this post, we are going to learn how to capture multiple pieces. In DaMath, it is possible to capture multiple pieces. 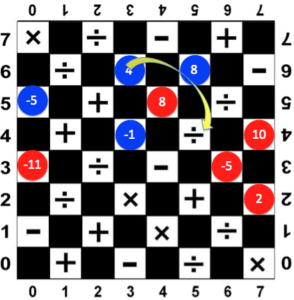 For example, in Figure 1, the Red Player placed 8 on (4,5). Now, the Blue Player is required to capture 8 using 4.